The procedure for obtaining a European Patent is regulated under the European Patent Convention. The granted European Patent is valid as a regular national patent on the territory of each designated country provided that validation procedure has been conducted. The European regional patent application is filed to the European Patent Office (EPO). The European patent is valid automatically on the territory of Belgium, Germany, France, Switzerland, Liechtenstein, Monaco, Ireland, Luxembourg, and the United Kingdom. It is necessary to conduct the procedure of validation if the applicant wishes to obtain a patent protection in other European Convention member states. Validation is a process of filing the corresponding request to the designated country, providing the translation into the national language, and payment of the maintenance fees. 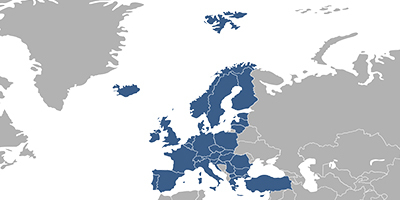 Validation of a European patent should be performed in such member states of the European Patent Convention as Austria, Bulgaria, Cyprus, Croatia, Czech Republic, Denmark, Estonia, Spain, Finland, Greece, Hungary, Iceland, Italy, Latvia, Lithuania, Macedonia, Malta, the Netherlands, Norway, Poland, Portugal, Romania, Sweden, Slovenia, Slovakia, San Marino, Turkey, as well as in Albania, Serbia. Effect of a European patent can be extended to Bosnia and Herzegovina and Montenegro which are not parties to the EPC but have signed extension agreements with EPO. The European Patent Organization signed validation agreements with Morocco, the Republic of Moldova, Tunisia and Cambodia in 2010, 2013, 2014 and 2017 correspondingly. European patents filed on or after March 1, 2015, can be validated in Morocco. Validation of European patents filed on or after November 1, 2015, is possible in Moldova. As of December 1, 2017, European patents can be validated in Tunisia obtaining the same scope of protection as national patents in Tunisia. European patents, filed on or after March 1, 2018, can be validated in Cambodia. Fees associated with registration of patents in Europe are available in the fee calculator.